Red Sea scuba diving offers you unobstructed opportunities to spot tropical marine life in crystal clear waters, ranging from sharks and dolphins to gorgonian fans and feather-stars. Variety is in no short supply either and depending on where you choose to dive. Your Egypt diving holiday can include shallow patch reefs, drift dives and walls, or a collection of some of the most interesting wrecks you are likely to find anywhere. In other places vibrant reefs stretch far into the sea and form intricate labyrinths of plateaus, lagoons, caves and gardens. The Red Sea is a fine choice for diving any time of year but the water temperatures do vary significantly. From June to August the water can reach 30°C but it falls to a chilly 22°C in February. Do bring an appropriate exposure suit for the time of year - northern hemisphere winter = 5 or 7 mm full length, northern hemisphere summer = 3 mm shortie to long. Air temperatures in Egypt reach 40°C (104°F) in August and fall to 20°C (68°F) in the winter (December to February), which may also dictate when you travel. Whale shark season occurs from the end of May until the end of July when this majestic creature can be spotted mainly in the northern Red Sea but also here and there in the south. To witness the sardine runs you need to go between the end of December and the beginning of February. · Resort stays will allow you the opportunity to base yourself close to a selection of fine dive sites. on the other hand, are always a top choice for those who want to see more than any land-based stay can offer. These dive cruises can take you around the best of the Northern (Sinai Peninsula and the Hurghada wrecks) or the Southern Red Sea. Breathtaking diving, fantastic boats and inspiring topside scenery all await you here. Abu Hashish: A shallow erg field lies on the south side of the island where lots of blue spotted stingrays, puffer fishes and morays are found swimming through a pinnacle landscape. A dramatic drift dive can be made along the eastern wall with the chance to see big fish out in the blue. Ras Disha: The fringing reef, which surrounds this cape, offers a good shallow dive on the hard coral garden found north of the lighthouse with schooling barracuda, napoleon fish and groupers. Garden eels. El Aruk Gigi : A cluster of a seven ergs laying in 10m - 15m of water. The whole area is home to sweet lips under the ledges, blue spotted sting rays in the sandy patches and glassfish and anthia fish swarm on the erg wall. One erg to note is the split erg, which has a grotto through it filled with glassfish, attendant red mouth grouper and numerous lionfish. Gota Abu Ramada : This area is commonly known as 'the Aquarium' due to the wealth of marine life. There is an abundance of hard and soft coral and schools of butterfly fish, banner fish, snappers and goatfish are found swimming around the mountains of coral gardens. You will find that dives at Gota will make you feel like you are swimming in a marvelous natural fish tank! Abu Ramada Island : Really two small islands surrounded by a single reef. Good drift dive along the steep eastern wall, with big fan corals, overhangs and swim through. Big groupers. see turtles, moray eels, crocodile fish and spotted stingrays, as well as schooling fusiliers and goatfish. Often done as a drift dive but can also be done as a normal dive where the boat is moored up. An excellent site for technical diving and courses. Shab Sabrina : The reef here pokes out from the eastern side of Giftun Kebira Island and has a coral garden extending 300-400m north of it. The best way to dive this site is on the drift, dropping 300m out and using the gentle current to make your way back to the boat mooring. This area is known for its beautiful coral landscape rather than its fish life. Umm Dom : Here the steep cliff of the north east side of Giftun Kebira island plunges into the depths and continues into the abyss, the reef wall drops to about 12m and then there is a steep, tumbling slope to the top of the drop off at about 27m. Most of the life here is above 15m as the lower slope and top of the drop off are sometimes swept by strong currents coming through the straits, stunting the growth of the coral and giving a lunar appearance. Half way down the slope you will find a lettuce leaf coral; in the blue you will find fusiliers, and triggers along with maybe sharks and turtles. At the top of the slope you will find morays, scorpion fish, barracuda and clouds of antheas. Whale sharks have been spotted at this site on occasions. Wreck of the El Minya : An Egyptian minesweeper sunk by Israeli fighters while lying at anchor in 1969, this wreck lies in 30m on a rock sea bed. The current here can be strong from the north and the visibility poor. There is a large debris field which contains a lot of 'LIVE" munitions, worth a look, but carefully. The wreck is only 70m long so there is plenty of time to explore everything including the blast hole on the starboard side, which can be penetrated. Penetration is not recommended elsewhere on this wreck. There is not much in the way of coral growth on the wreck but it does have its resident fish life. The blast hole gives shelter to shoals of glassfish and a lone anemone and resident clownfish are also in this area. Above the wreck are shoals of jacks and small barracuda. Torfa Fanus (East) : This narrow reef creates a huge calm lagoon, a great place to stop for lunch and catch the sun before the second dive of the day. The lagoon itself and the enclosing reef wall is relatively uninteresting and naturally lifeless but on the seaward side the area bursts with all manner of sea creatures. Swim through the gap between the first erg and the reef wall and head across the coral garden to the second erg, home to hordes of glass fish and the very occasional frog fish. Continue with the reef wall on your left to see the gorgonians on the corner of the reef where it turns west, if you have enough air continue along the north face where the corals are pristine, if not return with the reef on your right and explore the first erg before returning to the boat. Dolphins are often encountered anywhere around this reef so keep an eye out. Umm Gammar : This offshore Island is surrounded by good diving on all sides. The south end has a shallow plateau where the moorings are positioned; this location is the most used. For first timers at Umm Gamar the dive will take place from the plateau, moving eastwards to the drop off then north along the wall. After a short swim against the current you reach three pinnacles close together, chimneys reach through the pinnacles toward the surface. Afterexploring this area you take advantage of the light current to drift back to the corner of the plateau where three small ergs are found, covered in glass fish. Finish the dive on the plateau exploring the numerous coral heads and reef fish. The plateau is home to Napoleons, Emperor Angels and free swimming Morays. The east and west side have awesome drift dives and the northern tip or "halg" has a magnificent coral garden but is only accessible in very good weather. Big groupers and lots of sweepers live in the multiple caves found along the eastern and western walls and drop offs of this tiny island's fringing reef. 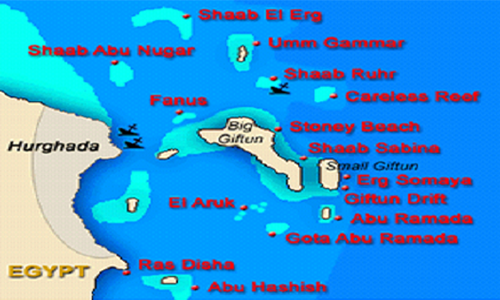 Shab El Erg : The most northerly site for day boats out of Hurghada. A huge horseshoe shaped reef offering many dive sites on all sides. The north point can be home to Mantas in season. The lagoon is dotted with ergs and is renowned for sightings of the resident dolphin community; divers have previously spent up to 30 minutes with dolphins here. The dive site schedule is arranged locally on a day to day basis, depending on where the guests wish to dive, availability, weather conditions and guests' experience. 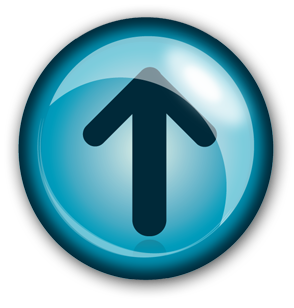 A standard dive day begins at approximately 8:00 am and ends around 4:30-5:00 pm. Courtesy return transfers are provided for all hotels in the Hurghada area which are beyond walking distance to the dive centre. You are advised to wait outside your hotel for pick-up at around 7:30-7:45 am and driven to the relevant jetty (5-20 minutes). Boat journey times range from 45 minutes to 1½ hours. Special trips can have longer journey times. Please bring your C card, medical form and logbook (proof of 1 logged dive within the last 6 months). The daytrip dive boats available in Hurghada vary in size, generally ranging between 17-28 metres. These are all hard boats and typically they are staffed by 4 boat crew and 2 dive masters, cruise at 10 knots, and have a saloon, toilets, kitchen, sunbathing area, shaded area, dive deck, ladders, rinse tanks and shower. The capacity varies between 18-30 divers, taking into consideration comfort levels and license numbers. All the boats carry a 40l emergency oxygen tank, MFA kit, evacuation procedures, life jackets, ship-to-shore radio and mobile phone contact. The most Northern dive site of the local sites, and as the name indicates, very beautiful. (Gamila in Arabic means beautiful). Usually an easy and pleasant dive, but currents can get strong. The vast sandy plateau inclines slightly, and has many coral colonies including a garden of large fan corals. Great for spotting many different type of fish, but beware of the Giant triggerfish in the summer months. Always a drift dive. Normally done as a drift dive, the reef at this dive site drops from the shallow bays to a wall down to 60+ meters, with many caves and overhangs. The best diving though is among the big coral heads in the shallow areas. Here, the chances of finding crustaceans hiding between the hard corals are good. It is also a good spot for Spanish dancers and cone shells in the sandy gullies. There is a red anemone at the depth of 12 meters, and some fabulous gorgonians to admire at around 20 meters. Also here, currents may be strong, especially around the corner. Can also be a mooring dive. Normally done as a mooring dive, this dive sites has high concentrations of reef fauna. Good place for spotting crocodile fish and blue-spotted stingrays. Often the dive ends with exploring the small caves and gullies in the shallow water (3-6 meters) and there are beautiful configurations of both hard and soft corals - it makes you feel like you were in the Disney movie 'Little Mermaid'. Great spot for usage of underwater cameras! Can also be done as a drift dive. This dive site has a nice canyon starting from 8 meters going down to 38 meters, although we normally exit at slightly shallower depths. Here you can also see remains of a small wreck, the dive boat Noose One that sank in 1994 after a fire and then drifted into the blue in 2004. There is an eel garden to the north, and this sheltered site is home for triggerfish, groupers, an occasional manta as well as some marvelous nudibranchs. Normally a drift dive. Most of the time done as a shore dive, and very good for training as it is well sheltered with an easy, sandy entrance and big sandy plateaus. During the summer months, there is a good chance to see Manta rays. A great place for night dives too, with lots of lionfish and some Spanish dancers. A site usually sheltered from waves and wind, with a colorful fringing reef with a slope to greater depths and dotted with small 'ergs'. At the top of the drop off, there are a few pinnacles frequently visited by pelagic fish. In the reef wall, there are also glass fish caves. A great spot with many scorpion fish and nudibranchs, although the current may get stronger at the corner. This is normally done as a drift dive. This dive site is a very good alternative when Far Garden becomes overcrowded; it also has a mooring. Here you can find coral structures of fire corals, sponge corals, pore corals, salad corals as well as anemones, and in between these coral formations the sand has formed 'streets' making it look like a city of coral. Closer to Far Garden, there is an ancient amphora originating from Roman times. An ideal dive site when the sea conditions are rough, as it is always sheltered. During the summer, a lot of rays like to pass by here, and in the winter you see schools of fusiliers, puffer fish, triggerfish as well as Blue-spotted stingrays. Closer to the Fiddle Garden, you find some fantastic coral pinnacles. Can be done as a mooring or a drift dive.. The most Southern of the gardens, this is a great location to spot Napoleon fish, Blue-spotted Stingrays and triggerfish, as well as occasionally a white tip reef shark. Here, you can also find some red sponge coral, as well as great formations of Porites and gorgonians. Can get strong currents at times though. This can also be done as a mooring or a drift dive. This is a local drift dive leading along a sandy slope up to a drop off. On the sandy slope you find some coral pinnacles rising up, and near the drop off you will see some huge gorgonians. In between there is a fantastic garden of different types of corals, as well as great amounts of surgeon fish, fusiliers, anthias and triggerfish, to mention a few. Another great drift dive among the local dive sites, Tower is a spectacular dive site characterized by a deep canyon whose walls descend vertically for over 120 meters. This definitely is a strikingly beautiful underwater landscape. At 15 meters, you will reach the edge of a large, slightly inclined sandy plateau that runs at a depth of 12 to 15 meters with some coral pinnacles, crevices and caves with schools of glassfish. The wall here seems bottomless and is covered in pink Alcoyonarian corals, hence the name. This is a drift dive along the reef, and to the south you encounter a sandy slope, which is richly covered in coral - just to emerge into a shear bottomless wall once again. Seems to be the home for groupers and wrasses. In the seventeenth century, a Turkish vessel with a cargo of amphorae containing mercury was wrecked here. A sandy slope that begins at the depth of 12 meters and has some coral pinnacles of various shapes that create a sort of magnificent garden of coral, with lots of glass fish, you also see remains of the amphorae here as well as a huge stone anchor and a massive 'modern' anchor, this is an underwater photographers dream. At times, currents can be strong. Always a drift dive. This dive sites topographical configuration is quite similar to that of Amphoras - a slope that runs at a depth of 10 to 26 meters, with coral pinnacles standing every here and there. On the edge of the coral gardens, there are fabulous colonies of Salad Coral and mushroom-shaped Porites. Another great site for underwater photography, as it is also inhabited by lots of butterfly fish and angel fish. May have strong current though, always a drift dive. This 'triplet' to Turtle Bay and Amphoras differs slightly in the taller coral pinnacles that rise on the slope between the reef ledge and the drop off, towering tall with a variety of colors. Definitely unique in its kind, you can explore the table corals and massive gorgonian fans while meeting Napoleon fish, Arabian angelfish and moray's. Don't forget your camera, as you find lots of glassfish here against a colorful background of soft corals! Also always done as a drift dive. The name of the dive site is also the name of the promontory with a high lighthouse that marks the beginning of the shipping lane towards the Straits of Tiran on the Western coast. The south side of the headland offers a superb gorgonian forest on the drop off; while the plateau is bursting with life and swarms of reef fish, as well as lots of scorpion fish and smaller forests of fire coral. The possibility of spotting whale shark or manta exists at the corner in early summer. Also funnels of barracuda can be seen, and - if done as a night dive - sleeping parrotfish. Currents may be strong though, especially near the cape. This dive can be done as a mooring or a drift dive. A sheltered bay with moorings, the Temple has some beautiful pinnacles, which are well worth exploring. The name comes from three coral pillars that resemble the columns of an ancient temple; although one of them fell over in the earthquake in the late 90's. This is also a good spot to see Octopus. Occasionally we have also encountered a friendly remora seeming to think we are of the whale-variety! Due to the currents, it is easy to get lost here, so don't forget your compass. Excellent site for underwater photographers, as there is a deep green anemone on 7 meters. Also, keep your eyes open for enormous black-spotted puffer fish. Normally a mooring dive. A collection of 7 reefs. Offers sheltered diving in rough weather conditions. Popular overnight location due to close proximity to the famous Elphinestone reef with very good chance to see spanish dancers on the night dive. Many swim throughs and caves. Often sightings of reef sharks on the southern outer reefs. Large reef in front of the last southern civilian town on the Egyptian coastline. Coral gardens formed near huge coral blocks porites and shoals of banners, goat fish, snappers and jacks. A horseshoe shaped reef creates a shallow turquoise water lagoon where a large herd of spinner dolphins live permanently. Several dives are found on its outer walls. The western tip provides a large group of pinnacles rising to the surface from a carpet of seagrass, populated by schools of reef fish. Big reef with big walls, hammerhead and grey reef sharks in summer, malabar grouper, barracudas, and schooling reef fish the rest of the year. Currents, soft corals and giant sea fans. A small collection of pinnacles lying just below the surface. Often large schools of jacks, oriental sweetlips, bannerfish, butterfly fish and goatfish. Only possible to dive in good weather conditions as it is very exposed. At the gate of the Straits of Gubal, ‘Bluff Point’ draws its name from the turbulence created by strong currents that beat the eastern most wall of the island. Huge fan corals cover an impressive drop off with caves and glass fish. Sightings of turtles and napoleon fish are not uncommon. An unknown wreck lies on the reef 300m north of the lighthouse, starting at 5m depth and sloping to 25m. Rumor has it that this is the wreck of an Egyptian patrol boat sunk in the 6 day war. The Red Sea Coast of Egypt is well-known for its warm climate and clear, calm waters, making it a perfect spot for snorkelers ready to explore the region. Most of the hotels on the Red Sea are self-contained vacation resorts, and the coast is dotted with spots ideal for snorkeling in Egypt. The resort town of Hurghada is among the most popular destinations on the coast, located just an hour (by air) from Cairo. Just north of the town of Hurghada is El Gouna, a top tourist draw. Makadi Bay and Soma Bay are top attractions for snorkelers that come to enjoy the warm waters and colorful reefs of the area. Further south, the seaport of Safaga is known for the healing properties of its black sand beaches. The best place for snorkeling in all of the Red Sea Coast is the National Park of Mahmya Island, covering 3000 square meters of Gifton Island just off the cast of Hurghada. Boats depart from the Hurghada’s Sheraton Marina and make the journey to the Mahmya Buoys in just 45 minutes. Motor boats then speed passengers to the island. More than 100 species of coral form reefs around island, playing host to countless colorful tropical fish. With its abundance of unique aquatic life and calm, clear water, Mahmya Island is a Red Sea Coast snorkeling destination not to be missed. Snorkeling (British spelling: snorkelling) is the practice of swimming on or through a body of water while equipped with a diving mask, a shaped tube called a snorkel, and usually swimfins. In cooler waters, a wetsuit may also be worn. Use of this equipment allows the snorkeler to observe underwater attractions for extended periods of time with relatively little effort. 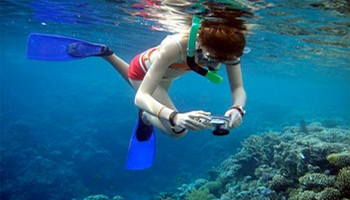 Snorkeling is a popular recreational activity, particularly at tropical resort and scuba diving locations. The primary appeal is the opportunity to observe underwater life in a natural setting without the complicated equipment and training required for scuba diving and it appeals to all ages because of how little effort there is, and without the exhaled bubbles of scuba-diving equipment. Snorkeling is also employed by scuba divers when on the surface, and search and rescue teams may snorkel as part of a water-based search. It is also a means to an end in popular sports such as underwater hockey, underwater ice hockey, underwater rugby andspearfishing. Snorkeling requires no special training, only the ability to swim and to breathe through the snorkel. However, for safety reasons, instruction and orientation from a fellow "experienced" snorkeler, tour guide, dive shop, or equipment-rental shop is recommended. Instruction generally covers equipment usage, basic safety, what to look for, and what to look out for, and conservation instructions (fragile organisms such as coral are easily damaged by divers and snorkelers). As with scuba-diving it is always recommended that one not snorkel alone, but rather with a "buddy", a guide or a tour group. on daily sailing boat cruises will amaze you with its array of underwater species with more than a 1000 species of tropical fish and over 200 species corals, not to forget the Red Sea Dolphins. Why not cruise in Sharm on our exclusiveVIP boat trip, enjoy VIP treatment at affordable prices! There are many Sharm Excursions but nothing quite like Sharm snorkelingtaking you to some of the most beautiful Natural Parks in the world. Day 3 SHAREM EL SHEIK or HURGHADA: Early AM flight from Cairo to Sharem El Shiekh or Hurghada. Transfer to port and board the dive vessel. Day 10 LUXOR: Early AM departure from vessel and tranfer to Luxor Hotel. Tour Luxor and Karnak Temples' and Sound and Light Shows at Karnak in evening. Day 11 Luxor: Early morning cross the Nile to the West Bank to visit the Valley of the Kings, Hatshepsut Temple, Colussus of Memnon, ect. Reture flight to Cairo and OVN at Movenpick Helipolis at Airport. Day 12 CAIRO: Full Day tour to Giza Pyramids, Sphinx, Cheops Solar Boat and Egyptian Museum. Enjoy the peaceful atmosphere of being at sea whilst you cruise past spectacular desert scenery and gaze at the breathtaking sunsets over the dramatic landscape. Airport transfer and Embarkation – Sharm El Sheikh. Embarkation usually takes place in the late afternoon. Disembarkation is after breakfast. Timing depends on flight schedule or any planned land excursions. Day 01 - Embarkation - Hurghada. - First Dive: " El Erk El Sagheer ". - Second Dive: " Abu Nuhas ". - Overnight at Shaeb '' Onghosh '' and a night dive. Day 02 - First Dive: " Gubal ". - Second Dive: '' Gubal ''. - Overnight at Shaeb Ali " El-Shabnah " and a night dive. Day 03 - First Dive: Wreck '' Thistlegorm ''. Day 04 - First Dive: " Mahmoudat ". - Night Dive and overnight at " Onghosh ". Day 05 - First Dive: " Onghosh ". - Second Dive: Seoul Kabir " El Fanar ". Day 06 - First Dive: Shabrour Um Gammar. Day 07 - First Dive: Abu Ramada. - Return to Hurghada and disembarkation. Day 01 - Embarkation - Mersa Galeb. - First Dive: Abu Dabbab. ( 2 hours sailing ). - Mersa Alam to Samadai; One hour sailing. - Night Dive: Samadai and overnight. Day 02 - Samadai to Wadi El Gemal; ( 2 hours sailing ). - First Dive: Shaeb El Sharm. (Wadi El Gemal). - Second Dive: Shaeb El Sharm. (Wadi El Gemal) or El Ghadir. - Night Dive: " Dah-ret " Wadi El Gemal and overnight. Day 03 - Wadi El Gemal to Satayeh ( 4-5 hours sailing )sailing around 04:00 a.m.
- First Dive: Shaeb Claudia or Maksour. - Second Dive: Shaeb " Abu Diab " a shore dive. - Night Dive: Abu Halawa. Day 04 - First Dive: Satayeh. - Satayeh to Wadi El Gemal. - Second Dive: Ras Um Krab. - Night Dive: Wadi El Gemal and overnight. Day 05 - First Dive: El Ghadir. - Second Dive: Shaeb El Ghadir. Day 06 - First Dive: Elphenstone. - Second Dive: Abu Dabab. 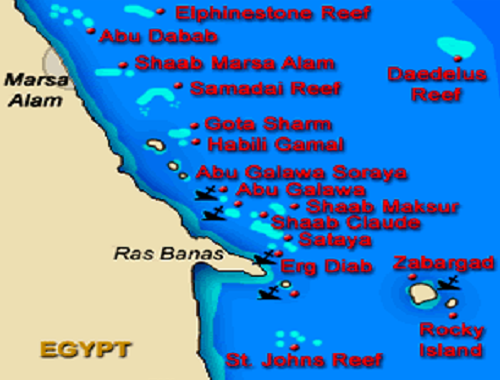 - Night Dive: Shaeb Abu Dabab (another part of the big reef) and overnight. Day 07 - First Dive: Ket-aat Abu Dabab. - Second Dive: Ket-aat Abu Dabab. - Night Dive: El Shouna. Day 08 - First Dive: El Shouna. Transfers Between Marsa Alam Airport & The boat. Seven nights accommodations on board with all meals include. Preset menu. sailing itinerary and diving as listed ,Itineraries are just an example of North and South sailing/cruising Safaris, there is a lot to see! 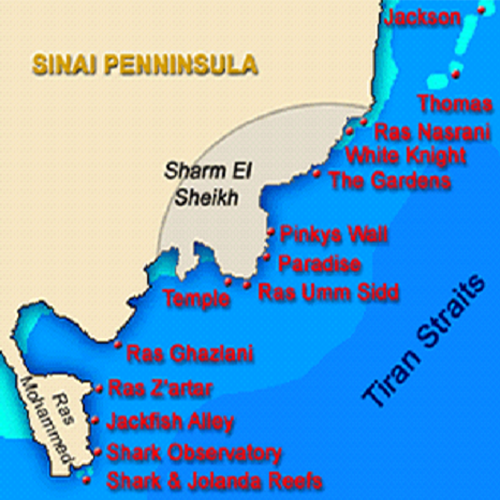 Sequence of itinerary and diving sites depend mainly on weather conditions. Please remember; Diver's safety always comes FIRST !! Sailing time is approximate, depending on weather conditions! Your Captain is one of the best in the Red Sea, please always follow his advice! Your Dive Master is well experienced in this area. He is your Key to a safe dive! Instructors on board are available to answer any of your questions. Breakfast and travel by car through the Sinai Peninsula. It was in the Sinai that Moses received the Ten Commandments. Prophet Elyah sought refuge from Queen Jezebel and the Holy family traveled on their journey into Egypt. Lunch, then visit the St. Catherine Monastery, built by Emperor Justinian in the 6th century to shelter Christian Monks. The Monastery contains the Chapel of the Burning Bush, the mosaic of the transfiguration of Christ and a library containing early Christian manuscripts. You will see as well as climb if you wish Mount Moses Mountain which is beyond the Monastery, where the Monks have built a staircase of rocks consisting of 3,750 steps leading to the summit. Overnight at the St. Catherine Village. Domestic Airfare in Egypt. All taxes, service charges, port charges and entrance fees to sights mentioned included as well. All meals are included as indicated on itinerary. All transfers, meeting and assistance and baggage handling is included. "If any modifications or changes are needed to package, that will be accommodated at an extra cost".